Across the globe, we spend a great deal of time in front of the TV or watching movies. Career Reels is a show that discusses how you can become the star of your life. Carolyn and her guests will share with you tips and strategies on how you can reach and stay at the top of your game. You'll also hear about hot topics and trends that can make a difference in your career or business. So tune in the second Monday of each month to hear Career Reels live. Can't listen live? You can always catch the replay on Blog Talk or iTunes . Carolyn R. Owens is the Chairwoman and CEO of Infinity Coaching, Inc. which provides career, leadership and life coaching that moves individuals forward allowing them to take COMMAND of their lives. With over 25 years of proven experience, she is a leading authority on leadership and professional development and has worked with and trained top leaders across the globe. Carolyn is recognized as one of the select few, certified Rapid Employment Master Coaches in the world. Having served in key leadership positions and as a successful business owner, she knows quite well some of the challenges one faces when pursuing the career and life of their dreams. Prior to starting her career at Infinity Coaching, Carolyn served in the United States Navy, for over 24 years, retiring as a Navy Commander in 2012. During her career, she served as the director, Human Capital Management of an organization of over 4,800 civilians, military, and contract personnel. She has assisted numerous clients with shifting their perspective, enhancing their professional and personal lives. 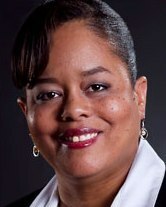 Carolyn served as the President of the Maryland Career Development Association and is the host of the podcast, "Let's Coach". She has been featured in Money Magazine, Fox News Magazine Website, Huffington Post, YourTango.com, Legacy in the Making Magazine, and many other publications. She is also a frequent guest expert on local and national radio shows. As a coach, she utilizes her years of proven experience to partner with her clients helping them to connect inner passion and purpose to outer goals and strategies to obtain powerful and sustainable results. Through the coaching process, clients have been able to create greater fulfillment so they can live extraordinary lives and have amazing careers.